BBC World Service - The Inquiry, Is Russia Vulnerable? President Putin’s action in Syria is another dramatic step in his increasingly assertive foreign policy. But the White House has described the move as motivated by weakness. Russia’s intervention in Syria caught the world by surprise. Moscow gave Washington just one hour’s notice before it began its aerial bombardment. Russia claims its jets are attacking the so-called Islamic State. But reports suggest the Russian pilots are in fact targeting groups linked to the Free Syrian Army - the main opposition to Syria’s President Assad, who is a Russian ally. It is the first time President Putin has deployed force beyond the borders of the former USSR and another dramatic step in his increasingly assertive foreign policy. But Josh Earnest, President Obama’s press secretary, has described Russia’s action as motivated by “weakness”. Is he right? Ambassador William Courtney of the Rand Corporation argues that the Middle East is the last place in the world where Russia can play a great power role, and that Syria is the last place in the Middle East where Russia can exert its power. Andrei Kolesnikov explains what he sees as Russia’s weaknesses; a weak economy, declining living standards and a working age population that is deteriorating. Dr Andrei Korolev disagrees. While international isolation and a faltering economy may have forced Russia to adapt, he says, it has done so in ways that make it stronger such as by forming a new alliance with China. The Hudson Institute’s Hannah Thoburn explains how a new politics is emerging. Russians are being asked to accept financial sacrifices in order to help return the country to its place as a global super power, and that so far its working. What Does the President Need to Know? Can Nigeria End Oil Corruption? 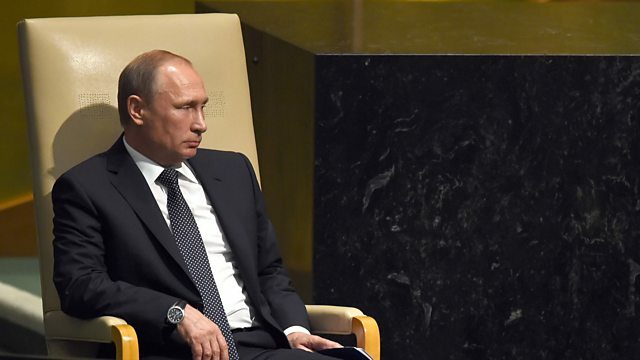 Vladimir Putin's Russia and how the world has responded to his increasing influence.